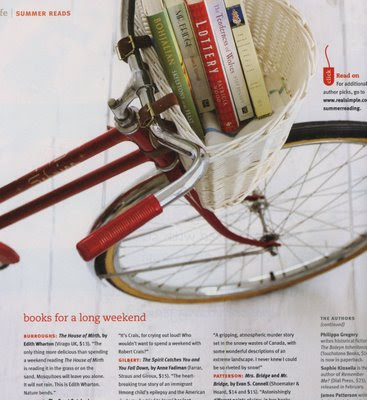 i officially loved the june 2008 issue of Real Simple. the pages are stuffed with excellent rip out for your binder material. like usual there is a plethora of ideas for organizing house, a fabulous guide to grilling & marinading, a roadtrip how-to, and the perfect guide to the best summer reads. p.s. Real Simple is also holding an intriguing essay contest about a day that changed your life. methinks it might be fun to enter. i completely agree - i picked up the new issue last thursday and had devoured it by friday. the road trip article was so super helpful, particularly since i'd just made some tentative vacation plans to roadtrip (er, ferry-trip? )to mackinac island in july! not to mention, i lovelove that cover photo. bright colours and white? how summertime pretty! marta, you should definitely enter. it would be a masterpiece. you're one of the most inspiring, sincere, talented writers i know! please do enter, i'd be so surprised if you didn't win! !